Alex Forrest-Hay, Vice President of Population Health business at Metabalon, discusses the recent announcement that Metabolon will be providing metabolomic profiling for the U.S. Veterans Administration‘s Million Veteran Program and how it will help improve healthcare for veterans. For more information about this program, click here. Guest Bio: Mr. Forrest-Hay joined Metabolon in 2017 to lead its Population Health business. He was most recently Director of Business Development at Thermo Fisher Scientific focusing on precision medicine and immuno-oncology. 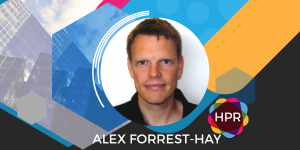 Mr. Forrest-Hay worked for Affymetrix for nine years prior to its 2016 acquisition by Thermo and was instrumental in closing multi-million dollar deals with the Million Veteran Program and UK Biobank. These precision medicine initiatives are the largest in the world and have analyzed DNA from over one million individuals. While at Affymetrix, he also developed and launched clinical RNA biomarker assays to enable accurate diagnosis of several types of cancer. Prior to that, Mr. Forrest-Hay was a genomics specialist at Beckman Coulter and worked as a researcher at the University of Keele. He has a molecular biology BSc Honors Degree from the University of East Anglia and a Higher National Diploma in applied biology from the University of the West of England. Neal Howard: Hello and welcome to this health supplier segment on Health Professional Radio. I’m your host, Neal Howard. Glad that you could join us. Our guest is Mr. Alex Forrest-Hay. He’s Vice President of Population Health at Metabolon and he’s joining us on the program to talk about a recent announcement that Metabolon is going to be providing profiling for the US Veterans Administrations Million Veteran Program. Welcome to the program, Alex. Alex Forrest-Hay: Thanks for the invite, Neal. N: So before you were VP at Metabolon over the population health segment, what were you doing? A: I have worked in the genetics field for about 20 years previous to joining Metabolon. Beginning of last year I worked for a company out of the Bay Area and this is called Affymetrix that did a gene expression profiling and genetic work for the research and diagnostics community. The reason I moved to Metabolon is actually, in Affymetrix, we were involved in some of these groundbreaking programs like the Million Veteran Program and the next extension is a lot of these programs is moving into the metabolomics which Metabolon is an expert in. So my background is very much on the genetic side but I’ve had a 20-year career working in that field and after I did my Ph.D. working on brain cancer. N:The Million Veteran Program, what does the program entail and what does it hope to uncover through the use of this technology? A: Yes. It’s a really incredibly ambitious program that the VA put in place about 6 or 7 years ago now. What they’re doing is they’re collecting biological samples from veterans who are part of the VA healthcare system. So we’ve collected about 650,000 samples from the VA healthcare system. One thing that’s great about the VA system is that obviously they have all the electronic medical records for these patients and they understand their health and they care for them throughout their lives. So they have really great long as you know data about each of these volunteer’s health. So the idea of this program is to collect the biological samples and collect genetic information about each of these participants and then also other types of molecular information like metabolomics. So the real goal of the program is to ultimately understand disease progression, try and be able to diagnose disease faster and also provide better information for interventions such as the correct drug to give at the correct time within a given a given man person’s health journey. So, yes, it’s a really incredible program. They’re obviously planning to recruit a million people. Right now they’re 65 or nearly 70% of the way there and it’s a very exciting program. N: So the VA is moving toward tailoring care for each veteran based on so much more than just blood tests or diagnosis or x-rays and things of that nature down to the very genetics of each patient. And now once they have a Million Veterans enrolled, is this something that they’re going to roll out? Is it going to be something ongoing or they want to stop and try and analyze the data that they’ve collected? preventative health care system away from the currents of reactive healthcare system we have today. N:What do you see as far as applications in the civilian World? Is that what we’re ultimately going for? Is to even be more efficient and use this as a kind of a test maybe? A: Yes. I think that’s exactly right. Within the VA system there’s a certain ailments that are more common than in the normal population things like post-traumatic stress and certain diseases that really manifest themselves within that population but the Million Veteran Program is also part of a much broader initiative and NIH funded initiative which is called “All of Us”, which you may have heard of where they’re collecting essentially healthy individuals from the general American population. I think this type of program is actually happening all over the world and the idea is that if we create enough data and enough information we’ll be able to actually apply this to health care systems all over the world. So this should have an impact on every individual within America and also globally. N: Now, I thought I heard you mention that other entities that are conducting similar research are getting data from healthy patients. A: Yes. That’s correct. One of the pioneering programs in this regard is in the UK. This program called the UK Biobank and they collected essentially 500,000 samples from healthy individuals and again getting their genetic and metabolic information and other forms of molecular information and then these people will obviously grow old ultimately and some of them will grow sick and where they all ultimately die and so what we’re going to be able to do is actually over time track this progression and see if we can understand the sort of evolution of those diseases. For some diseases such as Alzheimer’s and dementia and diseases such as this, is going to be really critical to see if we can track potential biological markers that could give us early prediction of a disease like that and then we could treat them much earlier and their healthcare economic benefits to that as well as obviously the benefits to the patient. N: I just wanted to be clear that this type of testing and research wasn’t only being conducted in a hospital situation where people are more likely to have an injury and illness as opposed to just across the board general population. So I understand now that we are collecting from those who are ill mentally and physically and those who show no signs of any type of illness but we are tracking them on a genetic level nevertheless. A: That’s correct. Yes and that’s absolutely correct and not just at the genetic level. I think as I said before the genetics is kind of the start of the journey and what metabolomics actually helps with, it kind of creates the roadmap to any given outcome. So if you’re healthy, the metabolomics gives you the sort of the road that led you to a healthy outcome but if you get sick you can also track that road back to the genetics. It’s some kind of predisposition to that and also whether you can intervene early to prevent that in the future. N: Now, obviously in the VA system there are a lot less younger people and children as opposed in the civilian world. Are these tests being designed to include all portions of the population? A: That’s a great question. I mean with the VA, there’s a kind of very specific population as you pointed out. 90% of the people are male. Most of them are over 50 who have enrolled in this program. So there are similar initiatives not through the VA, but through other funded initiatives looking at birth cohorts and tracking those cohorts of individuals through their lives. So there are programs in place now to actually gather this information at birth and then it’s strategically add points along their journey through life so we can actually track this in a longitudinal way. So there are programs that people can enroll in that would also do that. N: Well, where can we go and learn some more online about the VA’s program and about your organization as well? A: Yes. We have a really nice website with the information on the Million Veteran Program specifically which you can, I don’t have the link in front of me, but you can certainly find that with Google search and I would also encourage people to look at the Metabolon website and some of the sort of diagnostic elements of what you can diagnose with the metabolomic technology which is very very interesting. There are some nice case studies in there about how people have been diagnosed earlier with some of the diseases that they have and other good sources of information are in the UK Biobank, has a website that is there available to all to access, how they’re running that program and making that data available to the general public So they can understand their health. The ultimate goal of all of these programs is each individual who’s involved to actually take control of their own healthcare in a manner that will enable them to understand it and track their progression throughout their life. I think that’s what we’re heading is a revolution in healthcare, is coming down in the next 15 to 20 years we’re going to all have much more control over our own healthcare destinies and these programs are going to be essential to get to that. N: Thanks so much for coming in and sharing with us today, Alex. It’s been a pleasure. A: Thank you very much for having me, Neal. N: You’ve been listening to Health Professional Radio on this health supplier segment. I’m your host, Neal Howard. Transcripts and audio of this program are available at hpr.fm and at healthprofessionalradio.com.au. You can also subscribe to this podcast on iTunes, listen in and download at SoundCloud and be sure to visit our affiliates page at hpr.fm.